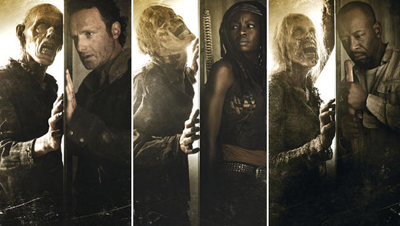 With the 7th season of AMC’s zombie behemoth The Walking Dead upon us, the previous season has finally reached our shelves in the form of DVD and Blu-ray releases. Let’s take another look at it, shall we? It goes without saying this review will be full of brain-chomping spoilers – you have been warned! Presumably, if you’ve come past the spoiler warning then you’re all caught up with the series. Or you’re just a spoiler addicted monster. Either way, we don’t have time to discuss every single character and moment (as much as I’m sure we’d enjoy it), so let’s just focus on the big moments. Season 6 of The Walking Dead comes in two parts, as is common with most television programmes nowadays. The first half covered Rick (Andrew Lincoln) and his merry band of survivors leading the Alexandria community through a series of problems including the threat of a large herd of undead bastards making their way to their fortified town, as well as dangerous scavengers known as the Wolves violently making their presence known. The second half introduced more survivor communities including the Hilltop colony, as well as the cruel Saviors led by the ruthless bat-swinging Negan (Jeffrey Dean Morgan). For me, the finale was one of the best episodes in years. Funny, because some critics called it one of the worst. To each their own! Jeffrey Dean Morgan disappears into the role instantly, making Negan a new favourite character to many people with only a few minutes of screen-time to his name so far. Oozing terrifying cool and charisma, he is easily the best thing to happen to the show since David Morrissey’s Governor. The Walking Dead is at its best with a strong living villain – zombies are scary n’ all, but they just stumble around confused, don’t they? Provided you don’t find yourself outnumbered by the fuckers at an undead birthday party, they’re pretty easy to escape. Psychopathic people, however…they could catch you. They’re scary. They’re smart. They’re cunning. And most of all, they’re believable. With Negan pulling the strings, Season 7 could just be the best yet.